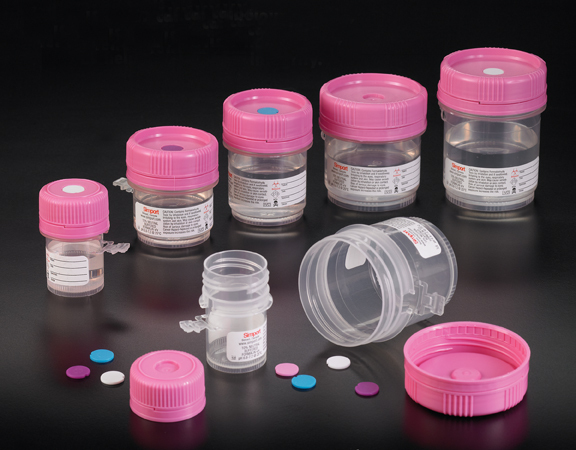 Especially designed for collection, transport and storage of histology specimens, Econo-Lab offers shatter resistant polypropylene containers, eliminating most problems of leakage and evaporation. Containers are uniquely stackable, shatter resistant and are manufactured from virgin, translucent polypropylene. The lids are ribbed for easy opening when hands are wet or gloved while the jars are stackable for easy, safe storage and translucent to allow specimens to be viewed without opening. They are manufactured from virgin polyethylene with a unique integrated leak-resistant seal. Containers are available in the more rigid straight side format. 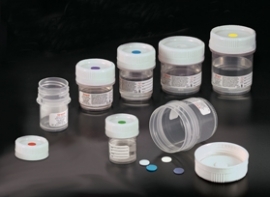 The uniqueness of the HistoTainer™ is that it incorporates an innovative tamper evident screw cap (M960 series) ensuring your peace of mind during transport or storage situations where someone might have manipulated the specimen without your prior knowledge. Can also be used without using the tamper evident locking mechanism. For color coding purposes, use a Capinsert™ (see T345 Series) on top of the closure. Ten different colors are available. Both containers and caps are manufactured without the use of plasticisers or mold release agents. All material used in manufacture are free from latex. All containers are 95 kPa compliant. Available in many sizes from 20 to 120 ml. The Simport HistoTainer™ is half filled with 10% Neutral Buffered Formalin as a fixative. 10% Neutral Buffered Formalin penetrates quickly, but fixes slowly. The Simport Formalin is enhanced by a buffering capacity that optimizing histological results by light microscopy and immunohistochemistry.